Fayetteville, AR: The University of Arkansas Press, 2015. Sarah Jones lives with her grandmother, Muhdea, and great-grandmother, Granny, in small-town 1960s Arkansas. Her young mother, Esther, has left the family for an art scholarship in Chicago, and Sarah’s uncle soon moves away to follow the Nation of Islam. 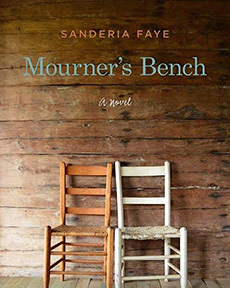 These departures leave Sarah, the elementary-school-aged narrator of Sanderia Faye’s debut novel Mourner’s Bench, under the influence of the family’s older generations, devoting most of her time to corralling and diapering baby cousins and assisting her grandmother and great-grandmother with household cooking and chores. Even as a child, Sarah thrives on the responsibility. She shoulders a heavy load under Granny’s and Muhdea’s watch but seems to regard the chores less as burdens than as components of a respectable life. It’s a domestic existence she prizes even if her mother, away in Chicago, seems to disdain it. As the novel opens, Sarah’s life moves solely within the circles of family, school, and her local church community, and she seems content with a perspective only that wide. She has found ways to forget Esther’s abandonment, discounting her mother as a sinner, and instead embraces Granny and Muhdea as her maternal guides. They’re the ones with common sense. They know that work needs to get done, and hard work is fulfilling. They’re known and respected within their black community. Sarah’s immediate aspiration, in the midst of these household responsibilities, is to sit on the Mourner’s Bench at church, where she could give testimony, repent, and pave the way for her future baptism. She’s convinced she must save her own soul; if her sins and salvation remain her mother’s responsibility (as dictated by the church), then she probably won’t make it to heaven. Sarah’s desire to reach the Mourner’s Bench — assuring God’s blessings but also giving her extra duties at church — seems to drive the first third of the book. She studies hard, is often praying. Her prospects look good. Cue the return of Sarah’s mother. Several years after leaving, Esther returns to find her daughter firmly upholding the old-fashioned lifestyle she herself sought to escape. Esther comes with new ideas about combatting racism and sexism. In Chicago, she internalized the teachings of Martin Luther King, Jr., for whom she worked as an artist, and fought with others for civil rights. Her return to the family marks not only her intention to take up the role of mother again, but also her belief in effecting change in her small Arkansas community. She attempts just that, assembling other civil rights workers to educate the neighborhood and take on local institutions, whether her family agrees with her choices or not. Interestingly, usually, they do not. Even fellow members of their church oppose Esther’s calls for racial equality, fearing the damage her radical ideas may do to their carefully maintained status quo. The center of this push and pull, of course, is Sarah, who herself is a bit of an anomaly, clinging to the ways of her grandmother and great-grandmother and showing a similar resistance to her mother’s calls for new thinking. Most troubling for her may be that Esther cares little for her desire to reach the Mourner’s Bench. The book is designed with a hinge-like structure that relies on the change in Sarah’s awareness. Mourner’s Bench is most successful in keeping the reader allied with Sarah’s feelings. We understand why she holds fast to the life with Granny and Muhdea and scorns the new politics Esther ushers in. But Faye skillfully allows us to experience the perception shift as Sarah does — or close to the time she experiences it. It’s easy to see the ways in which progressive-thinking Esther is ruining Sarah’s specific plans in the church, creating obstacles and unneeded tensions in her life. It’s easy then to wish, as Sarah does at times, that Esther would return to Chicago and let Sarah continue playing out her life under Granny’s and Muhdea’s care. Yet our feelings for Esther become cloudy and complicated when we learn that she has worked directly with King and other activists. Sarah may not yet know the impact of such figures, but she comes to understand, gradually, the need for change and racial equality. This positioning works well — readers’ perceptions of Esther begin to shift the more we learn about her politics; we’re just ahead of Sarah, knowing that she, too, will come to embrace her mother’s fight but not quite knowing how. This creates an interesting tension that fuels the narrative momentum. Faye has created layers of complexity in Sarah’s changing alliances. It’s not simply the child finding that her primary caregivers’ way of life is lesser in the modern world, but instead finding that the mother who at one point had abandoned her may actually be right. And then where does God fit into all of this? The humor and candor with which Sarah tells her coming-of-age story carry the reader swiftly through Mourner’s Bench, which proves to be a layered understanding of a community’s tentative embrace of the fight for racial justice. Corey Campbell’s fiction has appeared in The Gettysburg Review, Colorado Review, The Rattling Wall, Necessary Fiction, Gulf Stream, Jabberwock Review, and Anderbo, among other publications. A PhD student in creative writing at the University of Houston and a graduate of the Warren Wilson MFA Program for Writers, she has received support from Inprint, Sewanee, and the National Academy of Television Arts and Sciences. She is completing her first collection of stories.